Here is a favorite post which has been inspired by multiple videos online. This is my attempt at making a zebra cake. A few months back, my older one turned 16. To make the event even sweeter for her, I thought about what I could do. I knew that she would love art on a cake. That was when I searched online for ideas which were doable for me. When it comes to art I have 10 thumbs. So keeping my thoughts positive, I went ahead and baked this cake. The expression on my older one's face when she saw the cake will remain in my memory forever. As I am composing this post, she commented that this cake would be her very precious gift of all times. I rest my case. In a mixing bowl, whisk yogurt, oil, fine sugar. After the sugar is well blended, add in the baking soda and baking powder. Mix gently and set aside for 10 minutes. In another mixing bowl, sieve the flours and set aside. Prepare an 8 inch baking tin by spraying oil and/or lining with a parchment paper. I used an 8 inch square tin. In the yogurt mixture, add the flour gradually and mix to get a smooth batter. Take care not to over mix. I had to add about 2-3 Tbsp of milk to get a flowing consistency. Divide the batter into two portions. In one of the portions, add cocoa powder and blend it in adding 2-3 Tbsp of milk as needed. In the prepared baking tin, pour 2 tablespoons of the Vanilla batter in the center and tip the pan onto all sides so that the batter spreads around. Again in the center add 2 Tbsp of cocoa batter, continue this pattern till a typical dark and light pattern alternates. [I wasn't able to use up all the batter as my batter was slightly thick and wouldn't spread out well. So I baked the remaining batter separately]. From the center draw lines on the batter in all 8 directions. Then again draw lines from the center between those lines to form a flower pattern. Bake in the preheated oven for 30-35 minutes or until a tester comes out clean. Remove and allow it to cool before slicing it as needed. With the onset of warmer temperatures, mint in my backyard has flourished and I am trying to use it in my everyday cooking as much as I can. Here is a typical chutney made in our families. We call it 'roti pachadi'. Here roti pachadi means chutney made using a mortar and pestle. They typically have lesser shelf life and is an everyday kind of a chutney. This chutney mixed with rice and ghee makes a nice addition to a meal. Roast coriander seeds, cumin seeds, chana dal, urad dal, sesame seeds, garlic and red chilies separately and set aside to cool. Powder the mixture and set aside. In the same pan add a teaspoon of oil and fry the mint leaves until they wilt. In a blender, add the mint, the powder from step 2, salt, jaggery and tamarind extract. Add water as needed and blend into a coarse mixture. Prepare the seasoning - Heat oil, add mustard seeds, chana dal, urad dal, cumin seeds and asafotida. After the mustard seeds pop and the dals are golden brown, transfer it to the chutney bowl. Mix and serve. Check out the Blogging Marathon page for the other Blogging Marathoners doing this BM#89..
As part of whole grain cooking, I had this in my drafts for a few months now. I have cooked this khichdi a few times as I love the texture of barley. I actually add whatever vegetables I have on hand. This version of khichdi only zucchini and carrot. Wash and soak the barley and moong dal for a few minutes. When the display shows 'Hot', add oil and the seasoning. After the mustard seeds pop, add ginger and saute for a few seconds. Add in the carrots and zucchini. Sprinkle turmeric and add the barley and moong dal [washed, soaked and drained]. Add salt and pepper along with 2 cups of water. Set the mode to 'Manual' or 'Pressure Cook' [depending on the IP model]. Set it for 10 minutes. After it is done, let the pressure release naturally. Remove from the IP. Mix well. Garnish with roasted cashews. Enjoy it warm for a filling meal. After the Buckwheat Khichdi, here is a simple idea for a meal. 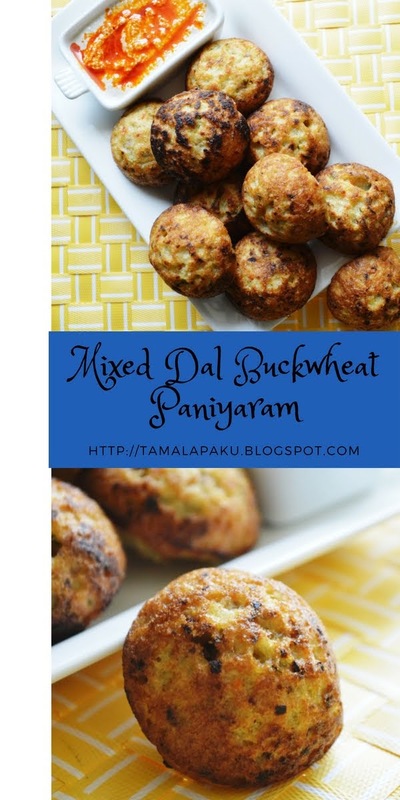 I typically make this for breakfast when the regular Upma gets a little monotonous. Sometimes I make it like a pulao with all spices and Garam masala or add sambar powder for a variation. My favorite is adding leftover sambar to the cornmeal. So the variations are left to your imagination. In a heated kadai/wok, add oil and add the seasoning. After the mustard seeds pop. Add ginger-garlic-green chili paste. Add the chopped vegetables and saute for a couple minutes. Add about 1 1/2 cups of water and let it come to a rolling boil. Add the corn meal and mix well. Sprinkle salt and cover. Reduce the heat and let the corn meal cook. Remove the lid after 10 minutes, mix it well and remove from heat. Serve hot with any pickle/chutney of your choice. This week I shall showcase some one pot meals which are life savers to me and people like me. These days one pot translates to Instant Pot in my life. I am sure I would have used my regular pressure cooker to make the same khichdi. I find that making such grain/seed based khichdi is very satisfying and filling as well. I sometimes add sambar powder to the khichdi. So feel free to play around with the vegetables and spices as needed. Wash and soak the buckwheat for a few minutes. When the display shows 'Hot', add oil and the seasoning. After the mustard seeds pop, add ginger and green chili paste. Saute for a few seconds. Add in the carrots and peas. 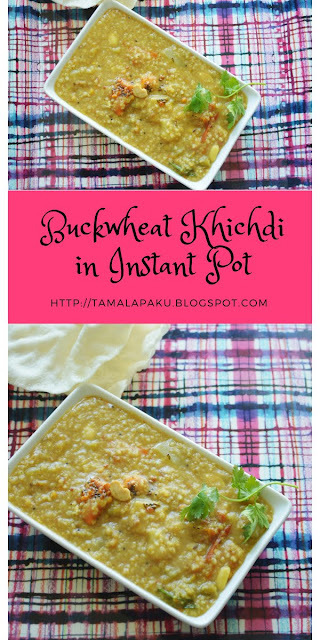 Sprinkle turmeric and add the buckwheat [washed, soaked and drained]. Add salt and about 2 cups of water. Set the mode to 'Manual' or 'Pressure Cook' [depending on the IP model]. Set it for 6 minutes. After it is done, let the pressure release naturally. Remove from the IP and add crushed peanuts and squeeze lemon juice as needed. Mix well. Garnish with chopped coriander leaves and enjoy it warm for a filling meal. To conclude the series of stuffed dishes, here is a dessert which is close to my heart. If you are a Gulkhand lover, then this is a must have dessert. I have made the laddus in a slightly smaller size so that it can be popped into your mouth which makes the flavor of gulkhand burst while chewing it :). My husband who is a greater fan of gulkhand felt that the gulkhand was not enough in the laddu :). In a heated kadai/deep pan , add a Tbsp of ghee and fry the cashews and raisins until the cashews are golden brown in color. Keep them aside in a separate bowl. In the same kadai, add the remaining ghee and add the rava and powdered nuts. Roast until it gets a golden hue and gives out a good smell. In the warm kadai, roast the coconut powder too. Let the rava cool down to room temperature. In a mixing bowl, add the roasted rava, coconut, cashews and raisins. Add fine sugar and gently mix. If the sugar grain is too granulated, it is better to grind it to a powdered form. Since we use fine sugar I didn't have to do this process. Now gradually add warm milk to the mixture and check if if the consistency is right to make a laddu. Meanwhile divide the Gulkhand into 12-15 portions. Roll them into marble shapes. Take small portions of the mixture, embed the gulkhand portion and make laddus by gently bouncing the mixture in your hand. 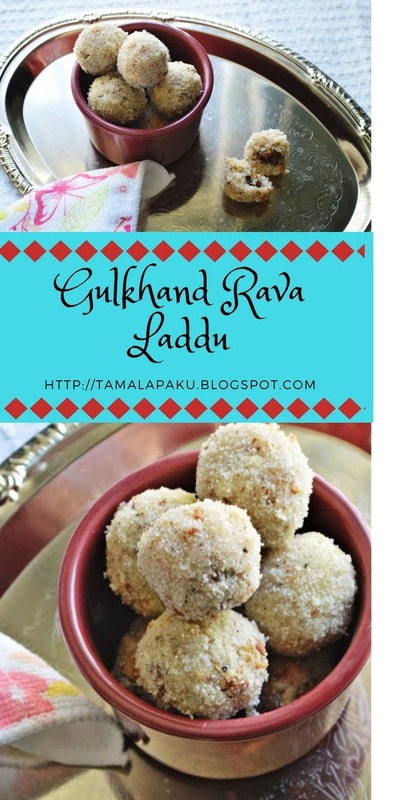 Take care not to press the laddu too hard as they would become very hard upon drying. Gently place the laddus in a plate to let them air dry. When they are dry enough, store them in an air tight container. Here is a simple weekend lunch platter with all our favorites. There is Thotakoora Pulusu, Stuffed Sweet Peppers, Mango Pickle, rice and yogurt in the platter. Typically we use a peanut-sesame-coconut filling for peppers. A few months back, I tried the potato filling and it was loved by all. Anyway what's not to like in a potato filling, right? In a mixing bowl, add the mashed potatoes, salt, ginger-green chili paste and red chili powder. Adjust taste as needed. Remove the tops of the mini sweet peppers and also carefully remove the pith and seeds. Stuff the potato filling into the pepper. Get all the peppers ready. Heat a wok/wide pan. Add oil and after it is hot, arrange the peppers on the hot pan. Slowly turn the peppers making sure they are cooked uniformly all around. I usually cover it for a few minutes and flip them once in a couple minutes. Remove from heat after they are cooked uniformly. I have chosen to highlight some 'Stuffed Dishes' for this week. To make the best use of the puff pastry sheet in my freezer, I made these pinwheel puffs with a paneer-spinach filling which was an instant hit with the kids and adults alike. I found a variation of this recipe on the box of the frozen puff pastry sheet. My little one likes to be surprised by such goodies when she comes back from school. So another winner of a recipe here. Thaw the puff pastry sheet for 40 minutes as per the instructions on the package. Blanch spinach and drain excess water. Chop finely. If using frozen spinach, pulse it in a food processor. Crush Paneer, mixed nuts, and green chilies. In a mixing bowl, add in the paneer crumble, pulsed spinach, salt, red chili powder, onion powder and garlic powder. Mix well and set aside. Spread the puff pastry sheet on a clean, floured work space and roll it slightly to stretch it. Spread the Pizza/Pasta Sauce evenly on the puff pastry sheet. Spread the paneer-spinach mixture evenly all over the puff pastry sheet. From one side tightly roll the sheet like a carpet or jelly roll. Make 18 slices 1 centimeter apart and place the slices on the prepared baking tray. Bake for 18-20 minutes or until they become golden brown. Serve with any sauce or as is. When on the subject of summer coolers, I cannot possibly ignore the fruity drinks which can please my little one. When I was looking for some fresh ideas for summer coolers, I came across the Mexican cooler - Agua Fresca, meaning Fresh Water. I found that there are numerous possibilities and combinations possible. I chose Strawberry and Pineapple as my star fruits as they both happen to be my little one's favorite fruits. 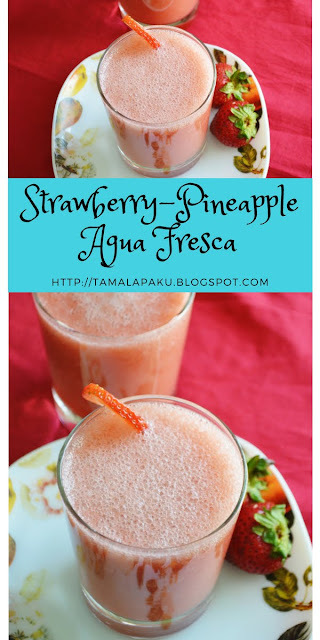 Blend strawberries and pineapple along with water and sugar until smooth. Strain if needed. [I didn't strain as I have a power blender]. Add lime juice and adjust the flavors as needed. Serve with some crushed ice. Sending this to Kid's Delight created by Srivalli and hosted by Mayuri this month.